Arthur Edward Waite and Pamela Colman Smith created the best-selling Rider-Waite-Smith tarot deck in 1909. 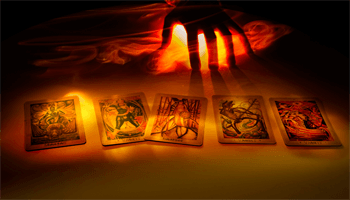 The tarot consists of two parts: the Major Arcana and the Minor Arcana. The Major Arcana is made up of 22 cards; the figures of the Major Arcana represent universal archetypes which serve as the basic patterns for human thoughts and emotions, as well as dramatic, life-changing events. There are 56 cards in the Minor Arcana. 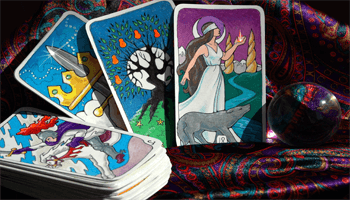 While the Major Arcana expresses universal themes, the Minor Arcana brings those themes down to the practical arena and applies them to everyday life. The Minor Arcana has four suits—typically called Wands, Cups, Swords, and Pentacles—and each suit has ten numbered cards and four Court Cards (King, Queen, Knight, and Page). A spread is a layout of the cards with a definite purpose in mind. Spreads can be simple—even one card can be a spread—or they can be very elaborate: there’s one spread that uses all 78 cards.